This rainfall map of the last 24 hrs. 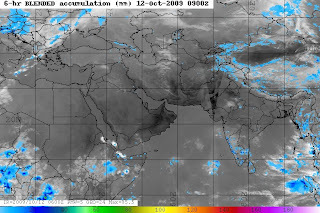 shows the rains gradually retreating southwards, and spreading dry weather in the rest of the sub-continent regions. Yes, IMD has now withdrawn the monsoon 15N upwards, 2 days after my stating about it. I estimate almost dry weather all over, except along the coastal regions of Karnataka and Kerala. COLA sees a vortex forming along the Karnataka coast on 15th, for a day. So, we can expect some heavy rainfall along the Karnataka coast for a day on 14th/15th. Manglore can expect good rains around the same days. No lows seen forming in the bay ! All estimates gone haywire! As yet. 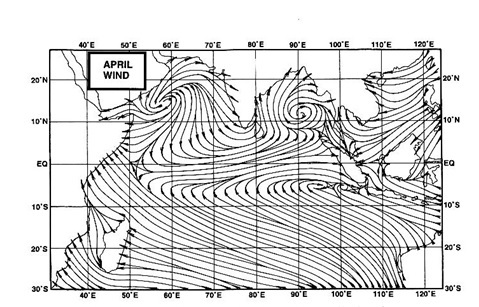 Many international models had foreseen a low in the bay in the 1st.week, and subsequently in the 2nd. week. And I had projected the arrival of the reverse monsoon in the south, around the 15th. on the assumption of the lows. But, I do not see that happening this week. And yes, a W.D. is on its way in the north. By this weekend, the Kashmir region and H.P. will get some rains and snow. The first signs of the nights getting cooler are seen in the northern and central regions of the sub-continent. Kalpa ( H.P.) saw Oc today, and Keylong and Leh were at 2c. Next week, after the W.D. a sharper drop in temperatures could be expected, specially in the north.